IUGUM (iou-gum) is a made up name. It means "yoke" in Latin. A yoke is that wooden piece with hitched oxen into pairs, but the word "Iugum" is also used in very early agricultural texts in reference to tines being trained on a support. Our Lagrein Reserve Burgum Novum gives a compact and concentrated wine with a dark red colour and soft tannins. The typical aromas are Chocolate, Coffee, Vanilla and Violets. A combination of the vines Vernatsch, Lagrein and Merlot which grow on rocky, barren and steep soil on sunny slopes Bozen, Überetsch and Unterland. The mix of Pergola and Guyot makes it possible to get small quantity but high quality. The grapes are rich on extract and give this cuvée elegance, a velvety and harmonic body. Ruby red in color with a deep garnet sheen, this fruity wine has a fine cherry bouquet. Balanced and round in flavor, it shows plenty of structure and is well-proportioned, with an elegant, lingering finish. Our Pinot Nero Matan is a wine with terroir and is thus well-structured, with an evident elegance, smooth and rich in aromatic nuances. The high temperature differences between day and night during the ripening season give this powerfully dark red wine a particularly fruit-toned character, lending fruit and pedigree to the Matan with its scents of forest berries. This wine, which is growing only in Alto Adige, is recognisable by its intense deep violet colour. Its aroma of forest fruits an violets, and its full, velvety body make it perfect for festive occasions. When aged, it still makes an exquisite accompaniment for meat dishes or partner for a meditative mood. This wine, ruby to violet in colour, is rich in tannins, intensive in colour, harmonious and tangy. It has a light note of violets as well as to aromas of forest berries, fresh cherries and plums. The intensive scent of red and dark berries as well as violets is typical of our vineyards in Montan. The Blauburgunder the Unterland region comes astonishingly close to some of the "model" wines Burgundy. This red wine develops harmoniously, with a full body and lasting finish. In the glass it gleams with a beautiful dark to ruby red. Ruby red with a deep garnet sheen, this wine has a delicate bouquet of blackberries, raspberries and cherries with a hint of vanilla. It is smooth and full-bodied, showing balance and elegance on the palate, and has both youthful force and pedigree. Ruby-red; Aroma delicate berry and dried fruit aromas; Taste dry, medium bodied, with a lively acidity and a light trace of tannin. Description: This strong ruby- to garnet-red wine has a light note of violets. 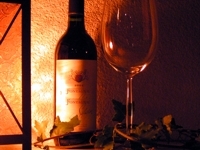 Its taste is rich in fine tannins; it is harmonious on the palate, with a full body and a velvety finish. The Lagrein draws its character and noble spicy notes in particular its aging in small oak barrels. Ruby to dark garnet red with slightly violet tones, pleasant bouquet typical for this kind of wine, light smell of violet, vanilla and dark forest berries, harsh-fruity in the palate, substantial and smoothly with a fine, velvety aroma and soft tannic acids. The harmonious, soft tannins on the palate and its dark garnet red colour are the main characteristics of this indigenous red wine Lagrein Villa Karneid Castelfeder. With its intese and complex bouqet and fresh parfume of wild berries and violets, the Castelfeder Lagrein Villa Karneid is ideal for red meats and roasts. Medium intense ruby colour with a garnet shimmer. Still somewhat closed, clean uplifted varietal aroma: impressions of red berry fruit, cherries along with oak spice (white pepper, cinnamon). Quite pronounced flavour, medium bodied. Fresh finish with good length and a presence of spicy tannin. Elegant style. Deep, dark red in colour, with fine aromas of dark berries such as mulberry; lightly earthy. Full-bodied, with supple tannins, velvety and uncomplicated; excellent length. Lagrein Joseph - 2016 - Winery Hofstätter Joseph South Tyrol 16,75 EUR / 22,33 €/lt. Pinot Noir Sanct Valentin - 2015 - Winery S. Michele Appiano 31,25 EUR / 41,67 €/lt. Pinot Noir Riserva - 2016 - Winery S. Michele Appiano 20,85 EUR / 27,80 €/lt. Lagrein Gries Riserva Magnum - 2016 - Winery Terlano South Tyrol 45,10 EUR / 30,07 €/lt. Pinot Noir Cornell Villa Nigra Magnum - 2015 - vine cellar Colterenzio 57,85 EUR / 38,57 €/lt. It\'s delicious. I never ate such meat before ..